Our inkjet technology centre is equipped with a variety of test equipment that can be used by customers, with or without our technical support. 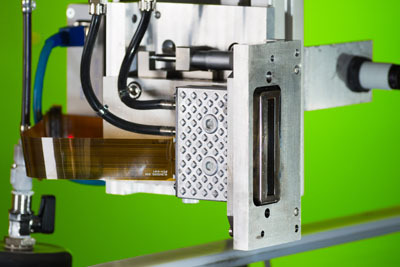 This includes a versatile inkjet press that is designed to allow flexible test set-ups, using top- or side-mounted printheads to print on horizontal substrates or 3D objects. We test inks for compatibility with specific substrates and printheads to obtain the highest print quality. And printhead waveform tuning is another area of our expertise.